As of January 2003 it was determined that in the good ole‘ US of A, there were approximately 12.3 million motor vehicle accidents involving over 21 million vehicles last year. This amounts to a little over one crash per second. Let’s take a look at four of the most common of these gazillion impacts and the typical injuries they cause. #1. LOW SPEED IMPACTS - - ESPECIALLY REAR-ENDERS. These are crashes that are considered to be any collision that takes place at speeds under 10 MPH. While there is absolutely no justification to call it a “Low Speed” impact that’s what the insurance industry loves to identify them as. Why ? Because a moniker like that is supposed to indicate that the, “so-called impact”, you were subjected to could not possibly have caused an injury. It’s true that when such a crash does take place there’s often not a lot of damage done to the motor vehicle and yet, in most cases, people involved in these types of accidents more often than not suffer injuries - - neck injuries especially! Although the insurance industry would like to have those making a claim think differently an injury can and absolutely does occur when a low impact collision takes place. The most common is identified as the “Whiplash”. This takes place when the occupants don’t have the slightest idea about the impending collision so they can’t brace themselves by forcing their back and/or neck against the seat or headrest. Because of this their body gets whipped and snapped about something fierce. Automobile bumpers are built to withstand up to a 5 MPH crash without damage. This is not done to insure the safety of the occupant but rather to protect and limit the damage to the bumpers, keeping the cost of repair to a minimum. Many times vehicle to vehicle impacts can sustain an impact of 8 to 9 MPH before there’s recognizable damage to the motor vehicle. However, when the bumper doesn’t crumble and absorb the force of the impact, more of that crash is felt by the occupants. IMMEDIATE INJURIES: The individual that’s been crashed into by another (even at only 5 MPH) is thrown forward with a severe jerking motion - - causing necks to snap and backs to twist. Because of this many “Soft Tissue” styled injuries take place, including multiple body bruises, plus chest and rib injuries. In most cases adjusters attempt to deny the possibility of injuries in a low speed impact but research substantiates just the opposite! Sure, the motor vehicle will show little damage but the velocity and accompanying force have to be transferred somewhere, and that’s to those sitting in that vehicle. Cars are built to withstand such minor impacts - - the human body is not! In most frontal impacts the occupant’s can generally brace themselves because they’re usually aware of the collision they’re about to be subjected to. In Frontal Collisions the speed and weight of the vehicle play a role in the injuries of the occupant. (The more the vehicle crumbles at impact the less severe the injuries to the occupants. Many times airbags will deploy). In frontal impact collisions the speed and size of the vehicle determines the injuries that can take place. (And - - getting back to rear-end collisions for just a moment - - the striking vehicle not only undergoes a collapse, but transfers momentum to the car that’s been struck by pushing it forward. The airbag may or may not explode. This depends upon the rigidity of the vehicle that’s been struck). IMMEDIATE INJURIES: Head and neck, back, spine, rib and clavicle, arms and legs, concussions, soft tissue, internal, dislocations, abrasions, cuts and bruises.48 to 72 hours later: Headache, blurred vision, dizziness and loss of taste, smell or hearing. Also, difficulty breathing, blood in urine or stool, swelling, loss of motion and visualized bruising take place. Many times the occupants head will hit the side window and bounce off of it. There are no air bags nor bumpers, engines, etc., to help protect ones body or absorb the force of the impact. IMMEDIATE INJURIES: Head and neck, arms & legs, soft tissue, dislocations, scrapes and bruises. 48 to 72 hours later: Pain, headache, blurred vision, dizziness, loss of taste, smell or hearing, numbness or tingling (and basically the same as those listed above) so, at the risk of being repetitious but because it’s so important, I must say once again: It’s of major importance that the individual exposed to impact - - no matter how slight it may seem to have been - - should immediately be examined by a medical professional. The typical roll-over accident is very serious. The most common factors in single vehicle accidents are approaching a curve at too high a speed, leaving the pavement or highway, or over-correcting the steering wheel - - particularly in vehicles with a short wheel base. The severity of injuries to the occupants generally depends on the beginning velocity of speed, the number of rolls, condition of the vehicle, and what your motor vehicle rolled through, over and into! Damage to the vehicle is generally extensive. It has been determined that 60% of the economic costs from roll-overs resulted from occupant ejection, and that the initial roll-over speed was between 40 to 60 MPH. (A recent study reported that restrained occupants showed a higher proportion of neck injuries than the unrestrained). IMMEDIATE INJURIES: The whole nine yards - all of those as detailed above. The bottom line (to all 4 of the above) is that in all motor vehicle accidents - - no matter how minor the damage it’s of the greatest importance that each and every individual immediately visit a medical professional for a physical examination and/or consultation. So, should you find yourself at the scene of an accident and somebody asks if you think they should see a doctor, your answer should always be, "ABSOLUTELY " ! Stare straight into their eyeballs and tell them, “It’s your body. There’s only one to a customer. You should do whatever you can to take care of it and protect it”. DISCLAIMER: This article ~ CAR ACCIDENT INSURANCE CLAIM ~ REGARDING IMPACTS AND INJURIES is intended for background information only. 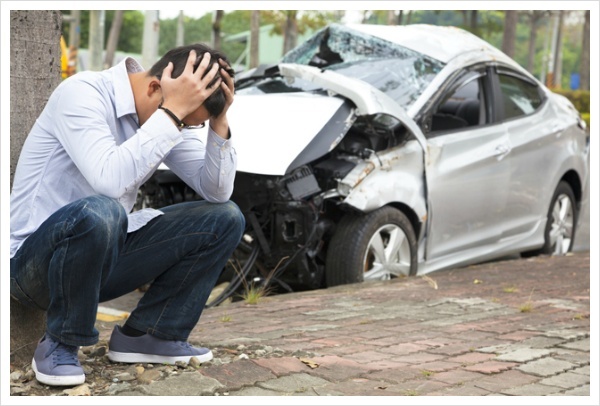 Its purpose is to help people understand the motor vehicle accident claim process. Neither Dan Baldyga, Thomas Brown nor ARTICLE CITY make any guarantee of any kind whatsoever NOR purports to engage in rendering any professional or legal service, substitute for a lawyer, an insurance adjuster, or claims consultant, or the like. where such professional help is desired IT IS THE INDIVIDUAL’ RESPONSIBILITY TO OBTAIN IT.